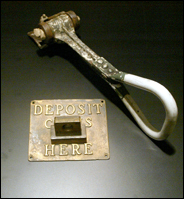 An old subway strap and a coin slot from an original fare box, in "The Subway at 100." Even in the world of yellow journalism, the headline was the kind usually reserved for a horrible crime or a scandal at City Hall, not a career decision by a maddeningly sedulous civil engineer. "Engineer Parsons Quits! Crazed by Suicide." As such, the library's show sets just the right introductory tone. The city's fascination with its subway has always had less to do with trains and tracks, facts and figures, and much more to do with the people who built it, who keep it running and who confound the laws of physics every day by squeezing into it like circus clowns into a Volkswagen. The library's exhibition — assembled with help from the New York Transit Museum, the Museum of American Financial History, the engineering firm Parsons Brinckerhoff and a private subway memorabilia collector, George Cuhaj — provides a succinct, well-edited look at the subway's 100-year sweep, especially as it affected the riders and changed the city around them. Then turn right around and flop in a lady's lap. Most effectively, however, the show demonstrates the meticulous resolve of Parsons and suggests that it undoubtedly took someone with his kind of whiz-kid hauteur to dig an underground train tunnel nine miles through the world's second most populous city — and finish the whole thing in little more than four years. As just one example of his thoroughness, the exhibition includes a copy of Parsons's still influential book, "Engineers and Engineering in the Renaissance," which he left unfinished at his death in 1932. Among chapters about Leonardo da Vinci and other of his forebears, he also includes small, detailed examinations of sewers, street cleaning and even street lighting during the Renaissance. In many ways, Parsons — product of a prominent family, avid collector, fearless traveler, only 45 when his underground masterwork was completed — was the perfect embodiment of his age. It was an age of endless urban optimism, in which the city was building furiously up, out and — in his case — even down. Times Square was about to be born in all its incandescence. The Public Library itself was rising over what had been the Croton reservoir on Fifth Avenue. The Flatiron Building, with its water-powered elevators, was brand new. The Williamsburg Bridge, at the time the world's largest suspension bridge, had just opened. And in Luna Park at Coney Island, patrons were paying a quarter apiece to climb into a giant winged ship called the Luna III for a simulated trip to the moon. Inevitably, Parsons's story recalls those of other visionary three-named gentleman engineers of his era, mostly notably Daniel Hudson Burnham, whose direction of the magnificent World's Fair in Chicago in 1893 was the subject of Erik Larson's best-selling book, "The Devil in the White City," published last year. It told the twin stories of Burnham and a Chicago serial killer, Henry H. Holmes, who built his World's Fair Hotel near the fairgrounds and used it to lure women to their torture and death. But while the Burnham story had a sinister counterweight, showing the dark side of urban empire-building, the Parsons story was always fairly well lighted and one-dimensional (despite the occasional suicide-by-subway). In fact, the subway's chief engineer had a lot in common with his creation. Both were relentless, efficient, often quite boring and yet breathtaking in their accomplishments. Clifton Hood, a subway historian, has written that while an undergraduate at Columbia University, Parsons was known among his classmates as "Reverend Parsons" because of his humorlessness. Still, he served as class president, helped found the student newspaper, held an oar on the rowing crew and was captain of the tug-of-war team. Later, in Parsons's professional life, Mr. Hood wrote, he "was hardly an amiable or engaging man, and he had little personal warmth." Yet he assembled around him a team of talented engineers, whom one journalist said he led "like a born general and diplomat." While form had a place in Parsons's world — much of the beauty of the subway's decoration is shown in the photographs in the library exhibition — function was clearly predominant. The subway was the world's first with regular express service, and the digging for it was speeded along greatly with the first extensive use of cut-and-cover tunnel construction — essentially digging a trench and putting a roof on it — instead of deep excavation. "I have the honor and the very great pleasure to state that the Rapid Transit Railroad from the City Hall station to the station at 145th Street on the west side line is ready and complete for operation." John V. Ganly, the assistant director for collections at the library, who oversaw the subway show, said that Parsons was apparently renowned for his practicality and precision for the rest of his life. In going through some of Parsons's personal letters for the exhibition, Mr. Ganly said, he found several from the New York Public Library itself, which Parsons served as a trustee. Mr. Ganly said he had assumed that the letters would all be about the library's aspirations and other high-minded subjects. But some were about a much more earthly concern: how to fix things when they broke. "They were always asking him questions about the boiler in the basement," Mr. Ganly said, smiling. "They knew he was an engineer." Randy Kennedy, a reporter for The Times, wrote a weekly column about the subway for three years. The columns have recently been collected in a book, "Subwayland: Adventures in the World Beneath New York" (Griffin Paperback). "The Subway at 100: General William Barclay Parsons and the Birth of the NYC Subway" opens Tuesday and runs through Dec. 31 at the New York Public Library's Science, Industry and Business Library in Healy Hall, 188 Madison Avenue, near 34th Street. Admission is free. Hours: Tuesdays through Thursdays, 10 a.m. to 8 p.m.; Fridays, 10 a.m. to 6 p.m. Closed Sundays, Mondays and holidays. Information: (212) 869-8089. Mayor George B. McClellan, center, with the IRT executives Frank Hedley and E. P. Bryan before the inaugural run on Oct. 27, 1904. BY all accounts, Thursday, Oct. 27, 1904, was a stirring day in the city's history. Flags and bunting were up everywhere, and factories gave workers a half-holiday. Crowds congregated at City Hall and along the city's first subway line; church bells rang, whistles screeched, sirens screamed, and ocean liners boomed their foghorns. Just after 2:30 p.m., a half-hour behind schedule given the overlong inaugural ceremonies, an olive green train loaded with bewhiskered and silk-hatted dignitaries pulled out of the City Hall station, with Mayor George B. McClellan at the controls. McClellan ran it flat out, his hand glued to a silver throttle, until nervous aides persuaded him to yield command to a professional at 103rd Street. Soon the train burst into the sunlight at the viaduct over Manhattan Valley; people who packed the hillsides cheered this first tangible display of the previously invisible proceedings. It then rolled on to its terminus at 145th Street, completing the 9.1-mile journey of 28 stations in just 26 minutes. The path of the IRT, as that first line was officially known, recapitulated the city's past and anticipated its future. From City Hall, the line plowed north along the old Commons where Stamp Act protesters once rallied. Then it pressed on under Centre Street, where Aaron Burr's wooden water pipes had been unearthed. Heading up Elm Street and Lafayette Place, it tacked under Fourth Avenue (beneath the site of the Astor Place riots), plunged (at Murray Hill) beneath the old Park Avenue tunnel and cruised straight to Grand Central. At 42nd Street the route zigged left to Broadway and zagged right into the former Longacre Square (now rechristened Times Square), maneuvering through the new building for The New York Times (above the pressroom, below the first floor). Here it headed up Broadway, through the emerging theater district, under a shored-up Columbus statue, up the soon-to-boom West Side and beneath a new acropolis emerging on Morningside Heights. Then, breaking into the open, the route traversed a viaduct that soared over the old village of Carmanville at 125th Street until it resubmerged at 133rd and continued north. For energy, that first train relied on what was known as the World's Greatest Powerhouse. IRT engineers had designed an immense, ultramodern generating plant at 59th Street and 11th Avenue to feed electricity to its entire system. Coal, which arrived by barge to a special Hudson River pier, was carried by conveyors through a tunnel to the powerhouse and there dropped into six generating stations, each of which had its own enormous chimney. The engines and alternators could collectively produce 100,000 horsepower, more than any electric plant ever built, and deliver it to transformers and converters housed around the city in substations. These, in turn, passed on 625 volts of direct current to third rails in the subway tunnels. Not only was the powerhouse a technological triumph, it was also a striking piece of architecture. The IRT's contract had insisted that all visible parts of the subway be designed "with a view to the beauty of their appearance, as well as to their efficiency.'' Stanford White created the powerhouse face-work. The substations were built to look like trompe l'oeil Beaux-Arts homes. Below ground, the stations were finished with tiles, marble, pottery and ceramic mosaics. In some stops, special panels denoted a historic building or event associated with the location. Oak ticket booths with bronze grilles were installed, ready to serve paying customers (turnstiles would not become the norm till the 1920's). But the first customers rode free, if only for the day, recalling for some Henry George's defeated proposal to subsidize mass transit by taxing speculative real estate profits. The first car having completed its first voyage (during which F. B. Shipley from Philadelphia became the first man ever to give up his subway seat to a woman), additional trains, bearing 15,000 V.I.P. 's, now chugged up and down the route until 6 p.m. At that point, 70 of the most powerful and prominent joy riders trooped off to a testimonial dinner for Belmont at Sherry's restaurant, a repast that featured a perfect facsimile - 40 feet long - of the 72nd Street station, complete with an operating set of IRT toy trains. Then it was the populace's turn. At 7 p.m. the crowds poured into the stations, where they were handed a booklet a Columbia professor had written assuring them the subway air was as pure as that in their own homes. An estimated 150,000 people rode up and down the line, thrilling, The Tribune said, to "the novelty of the whirlwind rush through the long tunnel, the thunder of grinding wheels and the mad dance of flying shadows past the car windows." One Henry Barrett took a more jaundiced view: he discovered, shortly after entering the 28th Street station, that he had been deftly parted from his $500 diamond stickpin, thus becoming yet another first - the city's initial victim of underground crime. Mike Wallace is the author, with Edwin G. Burrows, of "Gotham: A History of New York City to 1898,'' which won the Pulitzer Prize for history in 1999. He is working on the next volume. THEY are the events that gave birth to modern New York. In 1898, the five boroughs united in one enormous city of more than 300 square miles and upward of 3.4 million people. Two years later, to serve the huge new city, New York's fledgling Rapid Transit Commission contracted with the financier August Belmont to build, equip and operate the first stage of an unprecedented underground railroad system. In 1904, the first trains rumbled below the streets, and by the time the United States entered World War II the combined routes of the IRT, BMT and IND included more than 400 stations and more than 700 miles of track. The subway forever altered the city it was designed to serve. In 1910 most of Brooklyn was undeveloped, and much of it was still farmland. But the BMT changed all that. By 1940 Brooklyn had more residents than Manhattan, and neighborhoods like Sheepshead Bay, Canarsie and Bay Ridge were no longer remote. Similarly, the Bronx counted only 200,000 residents in 1900. By 1940, the population was seven times that, and the Grand Concourse, Loews Paradise and Krum's ice cream parlor were already legendary. But what if the subway had never been built? What if the grand passion of Andrew Haswell Green, the force behind the 1898 consolidation, had been art, or music, or women, or horse racing? Or what if August Belmont and William Barclay Parsons, the chief subway engineer, had died before 1898? One answer extrapolates from the city in 1900, before the subway opened, when too many businesses and manufacturers were located in Lower Manhattan and nearby sections of Brooklyn. At that time, the concentration of tall buildings, the volume of foot and vehicle traffic, the absence of open space (Central Park was the notable exception), and the dependence upon tenement housing made a decent life impossible for most workers. Residential overcrowding, a problem ever since the original Dutch settlers had huddled together below Wall Street for protection against the Indians, reached frightening proportions at the turn of the century. In 1900, the average population on the Lower East Side was more than 250,000 per square mile, and on certain streets three times that high. That is a density unmatched even in India. In the absence of the subway, such unbelievable congestion might have intensified in Manhattan and reached outward into Brooklyn, Queens and the Bronx. With no cheap and efficient way to disperse the immigrant tide, Gotham might ultimately have crammed 15 million people into its overcrowded neighborhoods. Admittedly, such an outcome is hard to conceive. Easier to contemplate would be a typical big Northeastern or Midwestern city that lacks a subway. From the mid-20th century, vast highways were built out of those cities, core areas emptied out, and city dwellers flocked to suburbs. If, like them, New York had no subway, it might have twice as many expressways and twice as many bridges. It would also have far fewer people. Between 1950 and 2000, St. Louis shrank from 857,000 to 348,000 residents, for example, and Detroit went from 1.85 million to 951,000. There and elsewhere, once vibrant neighborhoods and commercial areas were replaced by weed-covered empty lots and abandoned buildings. If New York had followed the subwayless path, instead of 8 million residents in 2000, it might have had fewer than 4 million, and much of the city would be forlorn and lifeless. Without the subway, so many more cars would have to enter Manhattan every day that congestion and parking fees alone would make the city uninhabitable. Without the subway, New York would not have increased its population density after 1950, an achievement it shares only with San Francisco. Without the subway, it's hard to imagine that New York would have remained a great city, indeed the ultimate city. Urban greatness, in the 21st century no less than the 20th, requires an efficient, safe and effective rail transit system. Without the subway, New York might very well have turned out to be Bridgeport. Kenneth T. Jackson, editor of The Encyclopedia of New York City, is Jacques Barzun Professor of History and the Social Sciences at Columbia University. THE flashing lights at the new Times Square entrances spell it out, a letter at a time: S-U-B-W-A-Y. That's one word New Yorkers agree on when they talk about their underground transportation system. But as the subway has changed over its 100-year history, its vocabulary has blossomed. Where does the subway run? To insiders, the 137 underground miles constitute "the hole." In London, the whole of "the hole" is called the Tube. In New York, "tube" is limited to the tunnels that run under the rivers. What do you call riders? "Straphangers" is anachronistic. It has been years since subway cars carried leather or ceramic straps, and last summer, the last metal loop grips yielded to poles, pipes and bars. Still, the term survives in the name of a transit riders' advocacy group: the Straphangers Campaign. "Alas," says Gene Russianoff, staff lawyer for the group, "we cannot call ourselves the Barhangers Campaign." Here's an alphabet of other terms born during New York's subway century. The A Division It manages the oldest part of the subway system, the IRT or Interborough Rapid Transit. Because its tunnels are smaller, its cars are narrower than those on the B Division, the former IND and BMT. Brightliners The stainless steel R32 subway cars that were introduced in 1964 and have served the A, C and E lines ever since. Corks The sarcastic nickname given to transit officers who were said to take every opportunity to rise to the surface. The nickname disappeared in 1995 when the transit and housing police were consolidated into the New York Police Department. The Deuce The intersection of 42d Street and Eighth Avenue. Old-timers say the term originally referred just to the station there. Everybody off Conductor talk, Gene Russianoff says, for the announcement, "This train is out of service." Fare-beater A person who tries to cheat the system. The ones who used to jump turnstiles are now often stymied by high-entry gates (see HEET), and those known as token suckers have been defeated by the MetroCard. Today's fare-beaters, called swipers or subway trolls, are vandals who break into MetroCard vending machines. Green light globes The glass balls that are seen above some station entrances and signal that the entrance is open. A red light indicates that the entrance is closed. The lights refer only to entrances; stations themselves are always open. HEET High-entrance-and-exit revolving turnstiles that provide service at unstaffed locations and discourage fare-beaters. IRT The Interborough Rapid Transit, the name of the original subway system, whose centennial is being observed this year and which was combined with the IND and the BMT in 1940 by Mayor Fiorello H. La Guardia. The abbreviations survive as geological shorthand in the speech of older riders. Joint bars Lengths of steel, perforated with six bolt holes, that connect rails. Where possible, they are being replaced by welded connections to control noise, explains George McAnanama, a veteran track worker. Steel contracts in winter; the resulting gaps produce clackety-clacks. Kawasaki Along with Bombardier, the newest subway cars, R142 and R143 models, made by Japanese and Canadian manufacturers (see new technology trains). The last of the total 1,292 were introduced last April. Loading guidelines Service standards devised by the Metropolitan Transportation Authority in the 1980's. The measure of permissible crowding is three square feet per standing passenger, or, as Mr. Russianoff observes, a square 1 foot 9 inches on each side. Rush times are another story. Mope Cop slang used frequently underground, says Al O'Leary, spokesman for the Patrolmen's Benevolent Association, to refer to someone who looks up to no good. New technology trains The R142 and R143 trains (see Kawasaki) feature lighted route signs and announcements recorded (before the last mayoral election) by Bloomberg Radio voices. Charlie Pellett is the man who says, thousands of times daily, "Stand clear of the closing doors, please!" On the road How transit workers often describe themselves when at work. Pirmann, David The man who created and maintains the Web site nycsubway.org, gratefully acknowledged as the source of many details reported here. Queens Boulevard line One of many local usages for parts of entire lines, in this case the E and the F.
Redbirds The old cars painted red as part of an anti-graffiti campaign. Most of them were reefed - scrapped at sea. Supervision As in "We are being held by supervision.'' What this means, says Gene Russianoff, is that the conductor has no idea why the train isn't moving. Third rail The source of electric power for transit, first to street railways and then to the subway. The term also frequently electrifies popular discourse, as in "The third rail of American politics is (Social Security, abortion, gay marriage)." Underwater tunnels The system calls them tubes and uses 14 of them. Work trains There are several kinds, all painted yellow. Some collect revenue ("We don't talk about them," a transit spokesman says.) Others de-ice tracks, deliver rails and perform maintenance. X-Overs The term for crossover switching areas, where trains switch from, for instance, local to express tracks. Yards New York City Transit has 19 of them, the largest in Coney Island, for storage, maintenance and repair. Zizmor Dr. Jonathan, a dermatologist known to millions for his "clear skin" subway ads. Countless riders have wondered whether that is his real name, and whether the first syllable is pronounced "zits." Jack Rosenthal, a former editor of The New York Times Magazine, makes regular guest appearances in the magazine's On Language column. By 1850 the island of Manhattan was bottom-heavy. People were packed into its southern tip, and a population explosion was adding wave upon wave of immigrants. The city needed new transit networks to ease crowds on its clogged streets and to expand into openland to the north and south. Subways won out over elevated trains, and New Yorkers have been riding in a hole in the ground ever since. Here are some of the high points and low of a system riders love, hate and depend on every day. The heart of the system was built during an intense period of expansion that ended more than 60 years ago. 1888 Mayor Abram S. Hewitt proposes a public-private subway, the basis for New York’s first system. 1900 August Belmont signs the first contract to build and run a subway. Digging begins. 1904 The system opens on Oct. 27. The 9.1-mile stretch of 28 stations is operated by the Interborough Rapid Transit Company (IRT). 1905 Service expands to the Bronx . . .
1908 . . . and to Brooklyn, adding a second contract. 1913 The city signs a third and fourth contract with the IRT and the Brooklyn Rapid Transit Company (BRT) to build and run new lines. The dual contracts system is born. 1915 IRT service expands to Queens.The BRT begins service between Brooklyn and Manhattan. 1916 The BRT Standard cars roll out; wider and longer than IRT cars, they fit in BRT tunnels only. Cars have more seats, larger windows and rolling destination signs. Center doors with pneumatic systems are introduced. 1918 The worst subway disaster in the city’s history occurs on Nov. 1 in Brooklyn near the Malbone Streetstation (now the Prospect Park station) just east of the park. On the first day of a strike by the BRT motormen, a dispatcher, who was filling in, was handed the controls after only two hours of training. At the end of his shift he was asked to run the Brighton Beach line, known for its sharp turns. His speeding train jumped the track on an S-curve on what is now the Franklin Avenue shuttle line. At least 97 people died; more than 250 were hurt. Malbone Street was renamed Empire Boulevard shortly afterward. 1921 The Giants play the Yankees at the Polo Grounds in the first Subway Series. Giants win 5 games to 3. 1925 Mayor John F. Hylan wins approval for a city- owned system almost entirely underground that will eliminate the els and add 59 miles of service. 1932 The city’s Board of Transportation wraps up construction of the Eighth Avenue line and opens the Independent Rapid Transit Railroad, the first city-owned and operated subway. It would be completed in 1940. 1940 The city buys the BMT (formerly the BRT) and IRT and combines them with the IND to become the sole owner and operator of all New York subway and elevated lines. 1941 Miss Subways contest begins. After World War II the suburbs drew people out of New York. As the city’s economy soured, crime and grit became a mainstay of the subway experience. 1947 The R-10 cars, a new generation, are designed as an altered version of the 1938 R-7 car. Advances include fluorescent lights, small fans and a plastic version of rattan for the seats. The cars also have better brakes and acceleration. 1951 Voters approve a $500 million transit bond issue, sold primarily to pay for a Second Avenue subway. 1952 The Board of Transportation approves the new Second Avenue line. 1953 The state creates the New York City Transit Authority, an independent body, to oversee operations. The Transit Authority commandeers the money to repair the dilapidated system. Plans for Second Avenue subway are shelved. 1955 The Third Avenue el is torn down in Manhattan, but there is no stategy to expand East Side service in response. 1966 Transit strike begins on Jan. 1, the first morning of Mayor John V. Lindsay’s administration, and drags on until Jan. 13. The union leader Mike Quill, ailing after his second heart attack, is jailed along with his colleagues. Thousands of workers protest in the streets. In the end the union wins pay increases, paid holidays and better pensions. Mr. Quill dies 15 days later. 1967 Air-conditioned cars are tested. Happily, they work. 1968 The state creates the Metropolitan Transportation Authority as the Transit Authority’s parent agency. 1970 Graffiti begins to appear. 1976 Miss Subways disappears after opposition by feminist groups. 1979 Curtis Sliwa founds the Guardian Angels as the Magnificent Thirteen Subway Safety Patrol. 1980 A strike shuts the system for 11 days. 1982 A series of five-year capital plans begins under Richard Ravitch, chairman of the M.T.A. He focuses on fixing aging stations, tracks and cars. 1983 Michael Stewart, arrested for painting graffiti, dies in police custody. Police brutality is alleged. Officers are acquitted of criminal conduct, but the Stewart family gets $1.7 million in a civil settlement. Percentage of cars with . . .
1984 Bernard H. Goetz, a white engineer, shoots four black teen-agers on a No. 2 train near Chambers Street, claiming he feared for his safety. Debates rage as to whether he acted in cold blood or self-defense. He is charged with attempted murder and assault, but convicted only of possessing a weapon illegally. 1989 New York City Transit says every car and station has been scrubbed of graffiti. Over the last 15 years the subway has become cleaner, brighter and more accessible. Stations have been spruced up, and new technology has boosted train performance. 1990 Brian Watkins, a tourist attending the U.S. Open, is stabbed to death in the station at 53rd Street and Seventh Avenue defending his family during a robbery. 1991 Five die in a Union Square crash. 1993 The State Legislature approves a five-year rebuilding package of $9.6 billion that includes money to improve stations. 1994 MetroCard arrives in the Whitehall Street station (on the N and R lines) and the Wall Street station (on the 4 and 5 lines). 1997 MetroCard works at all stations. Free transfers between trains and buses begin. 2000 The first Subway Series since 1956. The Yankees beat the Mets 4 games to 1. R-142 trains, designed with input from riders, start running. Doors are wider, windows larger, announcements automated. 2001 Nearly 1,400 feet of the 1/9 line tunnels fill with rubble or collapse after the World Trade Center is attacked on 9/11. The entire system is evacuated; no one in the system is killed or injured. 2002 One year after Sept. 11, ahead of schedule and under budget, New York City Transit restores service to the 1/9 lines. 2003 May 4 is the last day for tokens. Some token booths close this year. 2004 Preliminary designs and engineering phases are near completion for a Second Avenue line and an extension of the No. 7 train to the West Side. The city commits to paying for the No. 7 extension, but money for the Second Avenue line is still a dream. OVER the next several months, as the centennial of the subway's opening approaches, New Yorkers will hear a lot about the most momentous dates in the long and fascinating life of their mass transit system. Commemorating these events - the first train from City Hall to Harlem; the deadly Malbone Street wreck; the unification of the subway system under city control; the transit strikes - is a little like looking through family pictures of weddings and bar mitzvahs. They are the milestone events. But in any life that stretches over a century, there are also countless little moments, the minor triumphs, epiphanies and turning points that are almost forgotten. An article in The New York Times proclaims almost breathlessly: "The fourteen-months-old baby of John Royalson, a clerk in a Chambers Street hardware store in East New York, made street railroad history in Manhattan yesterday." Apparently the parents of baby Royalson manage to get his carriage into the subway on their way home from Central Park, to the astonishment of everyone on the train. The ride ends at the Brooklyn Bridge "when the Royalsons, escorted by an admiring throng, walked triumphantly through the station" on their way to catch a trolley. Subway workers report that they have begun to notice oddly enthusiastic people who ride the subway all day with no particular destination in mind. They refer to these people as "joy riders" or "buffs." An article in The Times describes the buffs this way: "This type of joy rider gets on a train, rides to its terminal, crosses the platform to another train and walks clear to its front end and rides through to the end of the line." A conductor notes: "I've put 'em off sometimes and they don't kick none. They just wait for another train." James C. Shramm, 24, is arrested and sentenced to a day in jail for dancing with a fire ax in the track bed at 42nd Street and Eighth Avenue. A northbound local was bearing down on him at the time. Mr. Shramm, an unemployed waiter and saxophone player, tells a judge he got the ax at a party in Queens and was simply taking it home. The Better Business Bureau of New York announces that many women seen recently in the subway dressed as nuns and collecting alms are not, in fact, nuns. According to a report by the bureau, the "nuns" pay $2.50 a day to an "unnamed organization" for official-seeming church credentials, which they return at the end of their workday. An article in The Times added that the nuns "formerly worked on a percentage basis" but "the organization found it was not getting its share and hence devised the day-to-day system." Max Lerner, a subway conductor for 19 years, is fired from his job as a security risk because he refuses to answer questions about his suspected Communist affiliations. A Supreme Court justice in Brooklyn upholds the decision. The Rev. Robert E. Richards, an Olympic gold medalist in the pole vault (left), reports that he has carried his 16-foot steel pole onto the IRT without incident. He had been unable to find a cooperative cabdriver. An article in The Times about Mr. Richards's subway ride reports: "To travel companionably with an intractable, hingeless, 16-foot 'metal monster' takes rare qualities. A pole-vaulter not only has to be an exceptional athlete but he must also be a man of vast foresight, immense ingenuity, overwhelming persuasiveness and boundless good humor.'' The article quotes a subway worker's words to Mr. Richards: "I don't know how you done it. But don't never do it again." A pair of rhesus monkeys (above) are spotted hanging around in the subway downtown. One is caught; the second eludes capture for several days. A Times reporter describes one sighting: "The monkey was standing on the northbound platform at the Rector Street station, as if waiting for a train, according to a passenger who made a report at the change booth." This second monkey was finally caught after startled pedestrians saw its fingers protruding through a sidewalk grate near Rector Street. A special nonstop train is operated briefly between Times Square and Van Cortlandt Park in the Bronx, where a ski slope has been set up over Holes 15 through 18 of the park's golf course. Riders take their skis on board, and among the first to take the ski express are a couple from Houston, "three boys from Long Island in search of girls,'' The Times said, "and a 200-pound St. Bernard named Brandy, who has never saved anyone because he lives in an apartment house in Queens." At a hearing, a director of the agency that runs the subway says the M.T.A. is so hard up that no private transit operator would want to buy it, perhaps because ridership has fallen to its lowest level since 1918, and 95 percent of the trains are marked with graffiti. He jokingly offers to sell the agency for a dollar. A woman in the audience whips out a dollar bill and announces: "I'm taking you up. And now you're all fired." According to an account in The Times, she then lectured the board loudly for 15 minutes. The movie "The Warriors" is released. Based loosely on "Anabasis,'' Xenophon's epic tale of Greek mercenaries, the film tells the story of a street gang that must fight its way from the Bronx back to Coney Island, and much of the journey is made by subway. The movie is blamed for causing gang violence in theaters, but it also causes flashes of recognition from frustrated riders. One gang member in the movie, Vermin, is heard to complain: "How much longer we gotta wait? We might be here forever. I'm sick of waiting for trains!" Subway police officers begin handing out cards to riders that read: "Hello. This note is not meant to alarm you, but to inform you that the NYC Transit Police Dept. needs your help in preventing CRIME by not becoming a VICTIM." The card includes some helpful tips on how to avoid becoming one. Keron Thomas, 16 (below), posing as a subway motorman, takes an A train carrying hundreds of passengers on a 47-mile trip through the city until he triggers an emergency brake because he is speeding. It is the first known theft of a subway train, and the thief receives probation. He later says of his caper: "It gave me a lot more self-confidence. It showed me that you can do whatever you want to do. You just got to put your mind to it." Randy Kennedy, a reporter for The Times, is the author of "Subwayland,'' a collection of his Tunnel Vision columns, published last month by St. Martin's Griffin. Here is a selection of current and forthcoming subway-related exhibitions. New York's subways have been an enticing subject for writers and photographers, and even more so this centennial year. Here is a guide to some notable subway books. An academic study that begins with the age of the horse. An exhaustive compendium, full of technical data. Separating the strands of subway lines (and buses too) into edible bites. A reprint of a 1904 celebration of the IRT. A scholarly yet readable account. Photographs of riders, including lovers. commuters, tourists, families and the homeless. A buff's valentine to the system. A collection of Tunnel Vision columns from The New York Times. A reporter for The New York Times recounts the subway's past and present through a set of memorable characters. Mass transit in 10 cities, from New York to Tokyo. The original subway ran north to 145th Street on the West Side of Manhattan. New York City's subway system first opened as a single line on Oct. 27, 1904. Amid the daily scrum of the New York City subway, few ever go looking for the past. Rushing to work or home, from one appointment to the next, riders scurry past mysterious doors that lead nowhere, walled off platforms and stairwells, faded sections of tile and other odd artifacts of history without a second glance. But this being the subway's centennial year, Joseph Brennan and Joseph Cunningham, a pair of transit buffs, agreed the other day to lead a small band in search of the original 1904 subway. Mr. Brennan, 52, helps administer the e-mail system at Columbia University but has never outgrown his childhood fascination with trains. A few years ago, he put together a Web site on the city's abandoned subway stations. Mr. Cunningham, 52, has written several books on the subway. On weekends, he volunteers as a tour guide for the New York City Transit Museum. The city's subway system first opened as a single line on Oct. 27, 1904. It began at City Hall and ranged north to Grand Central, where it made an abrupt turn west to a sleepy area that had recently been renamed Times Square, before finally heading north again to 145th Street. The original City Hall station was the system's centerpiece, with vaulted ceilings, skylights and chandeliers. But it closed in 1945. So, the hunt for the 1904 subway begins aboveground. Gesturing at the empty plaza, Mr. Brennan explains how the original line swung out from Brooklyn Bridge station and looped around in front of the steps of City Hall. And down in the Brooklyn Bridge station, at the southernmost end of the downtown platform for the No. 6 train, Mr. Brennan and Mr. Cunningham point into the gloom, where the tracks disappear around a sharp bend. City Hall station is just around the corner. A short distance up the platform, he ducks down to peer into a control room across the tracks. Through the glass window, the outline of a staircase is etched on the far wall, like fossilized remains in a cave. There used to be side platforms in this station, for passengers to unload out the rear of the train, Mr. Cunningham says. Upstairs in the mezzanine, the two men stop in front of a 50-foot section of wall of yellowing tile and red brick wainscoting, by the exit to Brooklyn Bridge. The station was renovated once in the early 1960's and again in the 1990's. But this length of original wall survived. "It's the one place they didn't touch," Mr. Brennan says. "There was no attempt to blend here," Mr. Brennan says. For the next stop, they skip Astor Place, a favorite among subway historians for the decorative terra-cotta beaver plaques. But Mr. Cunningham is dismissive: "Everyone knows about the beavers." Instead, they head to Union Square, where they climb the platform stairs to the passageway connecting the Lexington Avenue line to the N, R, Q and W trains. Here, the Metropolitan Transportation Authority has actually made an effort to preserve its history. Like sentinels, six jagged columns of concrete and tile line the busy passageway. They are remnants of the original two-story walls that used to extend from the platforms. 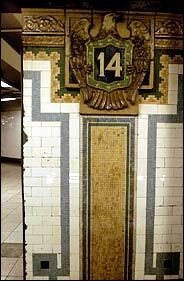 At the tops of these walls, bronze-colored eagles, clutching crests bearing the number "14," looked down on the tracks. For decades, these columns were hidden behind an area used for storage, Mr. Cunningham says. But in the late 1990's, when workers knocked out the walls to create the new passageway in the mezzanine, the columns were left on display, with the crests now at eye-level. At 23rd Street, the group surfaces briefly to head over to the downtown side. Over by a bus map, an original green tile mosaic has survived. The two men press on to Grand Central, weaving their way to the platform for the shuttle to Times Square. The original 1904 subway line headed north on Park Avenue and then curved left to enter Grand Central at 42nd Street near Madison Avenue. Grand Central was an express station, with two local and two express tracks. But one of the downtown express tracks was covered up in 1918, when the Lexington Avenue line was extended north. The original Grand Central station was converted into a shuttle station. Entering the shuttle area, the track on the far left, Track 1 for the shuttle, is the only one of the three that extends through the station today like the original line did. The track bends south, eventually connecting further down in the tunnel to the downtown tracks near 39th Street. Over in Times Square, plenty of 1904 remnants can be found. Back then, the area above the subway station had just been renamed, after The New York Times built its new headquarters there. At the shuttle platform, above a map of Midtown, the outline of an archway can be seen under a thick coat of brown paint. It marks the old entrance to the Times building. Up at 59th Street/Columbus Circle, Mr. Cunningham and Mr. Brennan are interested in only a portion of the station, because much of it was gutted in the 1930's to accommodate a passageway to the Eighth Avenue line. "Check out the ceiling," Mr. Cunningham says, stopping about 75 feet south of the turnstiles on the uptown side. Protected by a wooden newsstand that went into the station shortly after it opened and was only removed in the 1980's, a large swath of peeling beige-painted ceiling has been preserved. Intricate rosettes stud supporting beams and encircle light fixtures. At 66th Street/Lincoln Center, Mr. Cunningham says, "Here we have the old-old and the new-old." In a renovation in the late 1990's, workers installed new station plaques, done in the original 1904 style, but the "LC," woven into the "66," give them away. Lincoln Center did not exist in 1904, Mr. Cunningham says. At Union Square, jagged columns adorned with eagles line a busy passageway, remnants of the past. A city and its subways, inseparable. The W train curved into the skyline from Queens Tuesday. For a New Yorker just one day shy of turning 100 years old, the subway kept crazy hours yesterday. In other words, there were no hours it did not keep. As its neighbors around the world locked up their stations and turned out their lights, the subway started a new day, just as it has more than 36,000 times since Oct. 27, 1904. A few minutes after midnight, as she always does, Celeste Clarke stood inside a red brick building looking out over the vast Jamaica Maintenance Yard at the southern tip of Flushing Meadows-Corona Park in Queens, the nesting place where more than a thousand subway cars from the E, F, R, V and G lines return at the end of their runs, to be washed and swept, greased and patched, and then sent out again. Ms. Clarke stood in front of a big green panel with 86 levers that looked like something designed by Willy Wonka, above which sat an antique-looking lighted map of the yard and its fanned-out tracks. To the squelch of walkie-talkies and the light rock on the radio, Ms. Clarke walked up and down, her hands in motion like a maestro, opening the switches and signals that pumped trains back into the system like valves in a giant heart. "I'm like the Vanna White of the subway system," she said. The levers she moves look like the ones her predecessors moved when the subway started. The trains she dispatches still run on the same kind of wheels (steel), sit atop rails of the same gauge (4 feet, 8.5 inches) and draw the same blue-sparking direct current (625 volts) from the ominous third rail. The trains themselves might no longer have straps or cane seats or ceiling fans, and the price of boarding one might have increased 3,900 percent over a century, from a nickel to $2. But the experience of taking the subway in New York has changed little in its fundamentals since 1904, drawing an unbroken line back to that first day, when Mayor George B. McClellan grabbed a silver control handle and, at 2:35 that fall afternoon, started the subway in motion for the first time. Trying to describe a day in the subway is a little like trying to take a snapshot of the wind. It's everywhere and nowhere in particular. You can feel it and hear it yet chase in vain to capture the essence of the life lived along some 700 miles of track, inside 468 stations, where New Yorkers have done everything they've done on the streets above and more. They've been born there and died there. They've lived there and eaten there and slept there and dreamed the dreams they missed during the too-short nights before. They've found their muses and their soul mates. They've lost their wallets and their patience and, sometimes, their minds. Today, Mayor Michael R. Bloomberg and thousands of others will celebrate the subway's centennial with ceremonies and speeches. But telling the story of an average day in the subway - in all its mundane monstrosity - is as good a birthday present as any for a working monument that helped invent New York City by holding it together, day after day. At 12:05 a.m., as Ms. Clarke was pumping fresh trains into the lines, Larry Taylor, 41, a security guard at an office building on Columbus Circle was riding the longest one, the A train, which runs 31 miles from the top of Manhattan through Brooklyn and Queens and then across Jamaica Bay, where passing gulls drop clams on the tracks to shatter their shells. As he does every night Mr. Taylor was heading back home from work in Midtown, joining the first waves of night riders: the graveyard-shift workers, club goers, case-carrying musicians and sleepy, wandering homeless people who populate the trains from midnight to dawn. "They call the A train the 'Animal Express' because there are so many wild things riding here at night," Mr. Taylor said, his legs stretched stiffly into the middle of the aisle, the Barcalounger freedom of the night rider. "If you don't see it on this train, it ain't anywhere to be seen." This night was mostly calm, but Mr. Taylor said he had seen some things that amazed even him on the weekends, when the drinkers come out in force and "the real function at the junction gets started." "I might snooze once in a while on the job," he said. "But no way, no how I'm snoozing on this line. Homey definitely don't play that." On another A train headed to Bedford-Stuyvesant, Natasha Abbott, 23, was telling two friends her great subway story, the one about the magician. One night last month aboard the A, she said, a magician was trying to pull a quarter from behind a girl's ear. The girl's boyfriend misunderstood and, just as a fist was on its way to the magician's face, a dove burst from the magician's breast pocket and flew out into the car. "It was so intense," Ms. Abbott recalled. "The whole train started laughing." By 2:15 a.m., on another A train making its way from Utica Avenue back to Manhattan, the cars were starting to get that familiar overnight saloon smell. LaRay Farrow, a onetime subway singer and now a salesman at an electronics store, was headed to the West Village to a bar called Alibi, and was trying to prime the pump. "I get my buzz going on the train before I get to the bar," explained Mr. Farrow, 30, sipping from a bottle of Beck's in a brown paper bag. "Beer is too expensive at the bar so you got to do your work before game time." He reminisced about his first years in New York, when money was tight, and he took that leap that so many other brave and desperate subway riders have taken: He decided to sing and pass around the cap for his supper. It was one afternoon on the platform at the Broadway Junction station in East New York, where the crowd was tough and the police were tougher. And I'm singing this song for you." But his career in subway music ended early and badly. "No joke," he said, adding: "That was a New York City come-to-realize kind of moment." But in a subway system that practically invented the mass transit busker - mimes, doo-wop groups, mariachis, singers dressed in horse suits, Michael Jackson impersonators, people who play everything from kazoos to zithers to musical saws - other performers sometimes fare much better. Lorenzo LaRoc, stepped out of a cab on 42nd Street in front of Grand Central Terminal at 6:37 a.m. It was still dark, but Mr. LaRoc, the Heifetz of the subways and probably one of the highest-earning musicians in the system, no longer has to take the train to his gigs. He plays a strange electric instrument with a Plexiglas body the size of a violin and the longer neck of a viola. His lone roadie, Robert Colon, unloaded Mr. LaRoc's equipment from the trunk of the cab - three amplifiers, a car battery, a microphone, a folding table, a folding chair and a box of compact disks - and tied it onto two carts, which they haul down to the mezzanine level at Grand Central and drag through the turnstiles near the 4, 5, and 6 trains, his regular stage. For a performer as successful as Mr. LaRoc, the show unfolded with almost scientific precision. It began with Mr. LaRoc laying out seed money, four one-dollar bills - it takes money to make money, he explains. He then repeated only two songs, both of his own composition - "Savage Lover" and "Montuno in F." He keeps the list short, he says, because he estimates that his audience turns over completely every four and a half minutes. And his entire concert lasted only about 2 hours, through the height of the jam-packed rush, during which he sold 67 of his CD's at $10 a copy and had a wad of bills piled in his violin case. By 9:30, it was time to pack up. "We made money," he announced triumphantly." The cops left us alone." He added: "If I stayed, I'd clean up, but I'd be taxing my creative energy." Rush hour was now winding down, the last eddies of office workers swirling out of trains at Penn Station and Times Square. It was 9:45, almost time for Millie Mendez, a platform conductor on the uptown 1, 2, 3 and 9 platform in Times Square, to take off for lunch. "Lunch, breakfast, whatever you want to call it," she said. "I call it lunch, baby. I start here at 6." A train pulled in and Ms. Mendez - who has become somewhat famous just for doing her job and unleashing her foghorn of a voice, which has earned her the nickname "the Ethel Merman of the subway" - bounded into the crowd for the last time before her break, imposing order and enforcing manners. "Step aside," she boomed. "Let 'em out! Let 'em out! Please and thank you! Thank you and please!" "Don't worry, honey. There's always another train coming." Michele Acosta, 38, from Bay Ridge - legal secretary, mother of two, wife of a police officer - was among the last wave of the rush-hour commuters to arrive in Times Square on the R train, long renowned as one of the slowest in the system. But like many working mothers, she does not mind. She had a seat. She had her book - "How to Make Millions in Real Estate in Three Years Starting With No Cash." And best of all, she had anonymity and quiet, the kind of quiet that only New Yorkers can hear. Yes, the train wheels might be squeaking and the train deafening, but no one is talking to you, calling you or asking you to do anything. "Riding the subway is like a vacation," she said, "because at home - it never stops." The trains do not either, though they were beginning to thin out. By 12:30, the crowds were sparse enough so that riders on an uptown No. 2 train could easily recognize their fellow passenger: Mr. Bloomberg, who made a campaign vow to ride the subways and has valiantly stuck to it. He was on his way to Columbus Circle, standing as usual, with his bodyguards, and letting the fellow voters have the seats. "It's nice to see him on the subway," said Vojtech Bystricky, who has spotted the mayor underground more than once. He added, appreciatively, "He is as likable as a Republican can get." With the autumn sun beginning its early descent, the tide of humanity began to flow back the other way. Ms. Acosta was back on the train, taking a different, faster route home, the 6 train from Grand Central to Union Square and then the R - a sacrifice of a seat, maybe, for speed at the end of a long day. Paul Schneider, 24, a headhunter from TriBeCa, was getting off the 6 at Canal Street, along the route of the original subway line that ran from the old City Hall station through Midtown and up to 145th Street. Though his daily routine has blurred his appreciation of the great institution through which he travels, he grew almost patriotic when thinking about the landmark the subway would reach the next day. "It epitomizes New York City," he said, and then added, taking in the station, "Look at all the trash people throw around. They wouldn't do that in an old church." As midnight approached last night at the Jamaica yard, a tower operator, Marianne Kreuter, was ending her shift. She was pulling the big levers in the room overlooking the yard, preparing to send trains out into a new century. "It's like choreographing a ballet,'' Ms. Kreuter said as she flipped the switches on the control panel. "And you can call me Georgette Balanchine." Reporting for this article was contributed by James Barron, Michael Brick, Ann Farmer, Janon Fisher, Corey Kilgannon, Colin Moynihan, Jennifer Steinhauer and Ian Urbina. Happy birthday to the subway. We're lucky. One hundred years old and on the verge of bankruptcy. All that money to fix the things that were ailing and to keep it moving - only to find out the bill for it all is more than we can bear. The subways and senior citizens of this city are in the same predicament. Excellent photos from the Times and Newsday.....so I guess the new ban on photography in the subway does not apply to them, or are these illegal photos? One hundred years ago next Wednesday, at precisely 2 p.m., a wall of sound shook New York City from Battery Park to Harlem. Church bells and the sounding horns of ferryboats competed with the steam whistles of hundreds of power plants and the firing of salutes. Cheering citizens flooded the streets, creating what this newspaper described as a "carnival'' atmosphere that had the city "in an uproar from end to end." The cause of celebration was the completion of the first section of the New York City Subway, a 9.1 mile route from City Hall to West 145th Street operated by the private Interborough Rapid Transit Company. New Yorkers, who had suffered from the traffic jams of a city with 3.5 million residents, could now travel beneath the crowds. Businessmen, who in those days before the telephone was ubiquitous had to meet clients face to face, traveled to meetings with newfound freedom. And residents of crowded tenements near their downtown workplaces were freed to move to the rapidly growing suburbs along the subway route. Proposals for a New York subway had come as early as 1865, when Hugh B. Willson, a Michigan businessman, laid out a plan to construct a tunnel for steam trains from the Battery to Central Park. Three years later, an inventor named Alfred Beach secretly built a 350-foot-long test tunnel beneath Broadway that used a giant fan to propel tube-shaped cars. But not until 1894 did the Legislature approve the bond issue for a subway, and work began in March 1900 on perhaps most complex civil engineering project in American history. Much of that responsibility fell on the shoulders of the chief engineer, William Barclay Parsons. He decided that most of the tunnel would be built just below street level using a method known as "cut and cover" that had been employed in the Boston subway three years earlier. Manhattan, however, had far more underground water, sewage and gas pipes than Boston, and in many places the island's nearly impenetrable Manhattan schist bedrock reached street level. Under Parsons' plan, picks and shovels were used to loosen and remove the earth, exposing the utility lines, which were disassembled and re-routed. Wooden bracing held back the earth as workers installed a concrete floor and steel supports, and began building the walls with a single row of brick followed by a layer of hollow ceramic blocks. After a waterproof layer of tar-soaked felt was applied to the ceramic blocks, the walls were finished with a layer of concrete. The tunnel roof was built by shoveling fresh concrete over arch-shaped wooden molds that were kept in place between the parallel roof beams until the concrete set. Track beds were filled with crushed stone, and workers secured rails to wooden ties with iron spikes. Once the concrete roof was complete, it was covered with a waterproof layer of tar-soaked felt, and the road was rebuilt overhead. Because the subway route needed to follow a reasonably even grade despite the uneven topography of Manhattan, substantial parts had to pass through stone. Rock tunneling was notoriously dangerous, so Parsons brought in miners from Colorado, Pennsylvania, Ireland, Scandinavia, South Africa and elsewhere to help with the most difficult section: a two-mile stretch from 158th Street in Washington Heights to Hillside Avenue in Fort George. When trains started running in it in 1906, it was the second-longest rock tunnel in the United States, behind only the Hoosac Tunnel in western Massachusetts. (A) Holes drilled into the rock were filled with explosives and detonated. (B) Large pieces of blasted rock were broken down to a manageable size and loaded into carts. (C) Sidewalls and floors were built by shoveling concrete against a "traveling" wooden mold. (D) Boards were placed over wooden bracing to hold the shape of the tunnel's concrete arch as it set. (E) Workers shoveled concrete against the boards until the arch was complete. Once it had set, the bracing was slightly lowered and the boards removed, then the entire traveling structure was rolled to the next section. (F) Fresh concrete was delivered to the face of the tunnel and hoisted to the workers above. (G) Donkeys hauled away the "spoil" in wooden carts. Stations along the route, 28 in all, were brightly lighted and decorated with intricate tiles to create a welcoming atmosphere for a public that held doubts about underground travel. Some believed the air could cause respiratory problems; others claimed that staring at the lights in the tunnel while riding caused an irreversible condition called "subway eye." Nowhere was the decorative spirit more on display than at the old City Hall Station, with its grandiose vaulted ceilings and chandeliers that exemplified the craftsmanship that went into the entire subway project. For all the excitement on opening day, it didn't take New Yorkers long to revert to their jaded selves. On Oct. 28, the day after the subway opened, The Times reported: "Men on the trains were quietly getting out at their regular stations and going home, having finished what will be to them the daily routine of the rest of their lives. It is hard to surprise New York permanently." Joe McKendry is the author and illustrator of the forthcoming "Beneath the Streets of Boston: Building America's First Subway." THE cover illustration for The New Yorker of March 3, 2003, was a hoot. It showed Osama bin Laden on a subway train leaning over seated riders to study the map. There he was, truly Osama bin Forgotten, ignored by New Yorkers heeding the unwritten subway rule that eye contact is to be avoided at all cost. But that is not what caught John Tauranac's attention. "Osama was looking at the map perplexed, which irked me," Mr. Tauranac said the other day. "I mean, he should have looked satisfied." You can't blame Mr. Tauranac for feeling annoyed, even if he was kidding. He has been making New York City maps for many years, and clarity, he says, is everything. As one of the people who designed the modern subway map, he takes it almost personally if someone seems bewildered trying to figure out how to get from here to there. "When you're designing a map, your basic obligation is to impart information," Mr. Tauranac said. "A pirate's buried treasure map - with the two-headed palm tree and the rock in the form of a skull and X marks the spot - that's an ideal map, because you can get your coordinates and you can figure out. 'I walk here, and I walk there and, boom, that's where I have to be.' That's what makes a map work." Subway maps in New York have not always worked. That is worth noting on the eve of the underground's 100th birthday tomorrow. As we pop the Champagne corks, it would be unseemly not to raise a glass to the modern map, all too often denied its due. Introduced in 1979 and tweaked periodically since, it is a model of clarity. Younger riders have little idea how confusing some earlier maps could be. Old-timers have a way of forgetting. But first, let's allow some people to take their bows. Parceling out credit for the map is a trickier business than you might think. Egos can be fragile, and they have been bruised over the years. Unwilling to choose sides (and basically being cowards), we will say with discretion that the map, now known formally as The Map, had many parents. They include Mr. Tauranac, who led a 1970's committee that supervised a redesign for the Metropolitan Transportation Authority; Michael Hertz, a graphic designer whose Manhattan studio drew the 1979 map and its successors; and Dr. Arline Bronzaft, a Manhattan psychologist who did studies of people's perceptions of and responses to maps. Others also deserve applause. But the goal here is to celebrate not them so much as what they produced. Theirs was no small achievement, as noted by Stan Fischler, a subway buff who has written several books on the subject, most recently "The Subway and the City: Celebrating a Century" (Frank Merriwell). From Day 1, back in 1904, Mr. Fischler writes, the challenge has been to come up with "a readable, understandable and - most of all - practical subway map." THAT is what the designers accomplished with flair in 1979. It may not be life-altering for people who take the same route every day, and practically know every platform tile. "But for the new rider it's critical," Mr. Hertz said. "I still get a pleasure in a subway station when I see somebody in lederhosen looking at the map." Frankly, we can't remember the last time we saw anyone in lederhosen yodeling on the BMT, but the point is well taken. 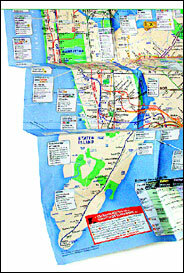 The modern map's immediate predecessor, designed in 1972 by Massimo Vignelli of Milan, was colorful and handsome. It was also often incomprehensible, based on what Mr. Tauranac calls "a certain cynical reality." Subway lines ran implausibly at angles of 45 and 90 degrees. To preserve its aesthetics, that map put the 50th Street stop on the Broadway line west of Eighth Avenue, far from where it belonged. In contrast, subway lines on the 1979 map looped across the city more or less as they do in reality. Better yet, you could see where you actually were when you emerged above ground. Some geographical distortion was inevitable, and still is. "We had to open up Lower Manhattan and squeeze the Bronx and Queens a little bit," Mr. Hertz said. But the new map was a revelation compared with the old, which often left the rider geographically clueless. Surprisingly, The Map sometimes packs an emotional wallop. It did just that when the subway masters distributed a temporary substitute soon after Sept. 11. Suddenly gone were the red, yellow and blue lines showing the trains that went to and past the World Trade Center. Staring at the blank, you felt almost as if a limb had been amputated. It was unsettling. A good map, Mr. Tauranac said, should be comforting. "That's one of the reasons a geographic map is so important," he said. "If you know you're going north on a map, and you see on the map that the line bears off to the left, you can feel when the train is going in that direction. And that's reassuring." What's next for the subway? A hundred years from now, the Second Avenue Subway will not only finally exist, it will be but one spur along a gargantuan line from Co-Op City though Brooklyn. Conversation inside trains will be livelier -- but not necessarily from face-to-face chatter. Cell phones will work underground when the tunnels are wired. And straphangers, now forced to peer into tunnels for a blinding pair of approaching lights signaling the train's arrival, will instead turn to a digital panel to see how long it will take for the next train to arrive. These are the high-tech images that a dozen transit historians, officials and experts envision when the subway marks its bicentennial in 2104. Some are hazier than others, and those who predict are quick to point out that some plans have come and gone in the past. "There have been a lot of phantom subways," said Clifton Hood, author of "722 Miles: The Building of the Subways and How They Transformed New York." All agree that the city's underground will be further automated, with expanded lines and better technology, in the not-too-distant future. "I believe that subways are always going to be the fastest mode of transportation," said Dr. Nabil Ghaly, chief signal engineer at NYC Transit. "I see that as we improve service, as we provide real time information, as we provide more trains, that's going to make our subways a more attractive mode of transportation." The journey starts on Second Avenue, where all subway dreams are born. Eighty years after the line was first proposed in a city bureaucrat's report, MTA planners think now is the time to bore ahead with the $16.8-billion, 8.5-mile project. It would be completed in 2020, running from Harlem to near City Hall. The project got a boost last week when Congress allotted a token $2.5 million for the project, but major funding questions remain. The Metropolitan Transportation Authority's next five-year capital plan calls for $2.75 billion to be spent on the project. Although the MTA faces spiraling deficits and has yet to pinpoint how it plans to pay for $16 billion of its capital program, other subway plans slated for work over the next five years include a new Fulton Street transit hub in lower Manhattan and an extension of the No. 7 from Times Square to the Javits Center. There are also changes inside subway cars. Starting next year, the L will be the city's first to emerge from a century-old signal system that literally kept riders in the dark. In its place will be technology that posts a train's arrival in stations, through a system that allows a computer to know a train's exact location. Previously, only an approximate location could be determined. The technology, Computer Based Train Control, will also allow speed to be computer-controlled, Ghaly said. Other lines are expected to follow. NYC Transit is also attempting to link stations with fiber optics, which would allow passengers to assess timetables on all lines. Next might be a push to wire tunnels for cell phones. The incessant, inevitable yakking might agitate riders even more than it does now. Gene Russianoff, staff attorney for the Straphangers Campaign, expects arrival times to eventually be posted on bus shelters. He also predicts train locations will one day be listed on the Internet, allowing straphangers to calculate exactly when to dash out of work. Computer-assisted operation is one part of a major attempt by the MTA to bring more automation to rapid transit. Some subways now use only one employee aboard trains, functioning as conductor and train operator. Passengers also are asked to buy MetroCards in machines as the MTA limits the number of token booth clerks. So far, the changes have not made a huge dent in NYC Transit's work force, said Joshua Freeman, who has written a book about Local 100 of the Transport Workers Union. He expects the number of workers to continue declining -- but not disappearing altogether. "Things get dirty, people get sick," said Freeman, a professor at the Graduate Center of the City University of New York. "I think that there will be considerable human involvement for at least many, many, many decades to come." Crossing the Hudson Even as the number of workers shrinks, the size of the transit system will grow, according to the predictions. In 100 years, the Second Avenue line might be but a piece of an impressive route starting in Co-Op City and stretching into Brooklyn, through a new East River tunnel, said Stan Fischler, author of six books on the subway. New Jersey-bound riders might even be able to ride the No. 7, predicted author Brian J. Cudahy, who says the city might build on the line's extension to the Javits Center by taking it clear to Union City, N.J. "If you're going to spend 2 billion, why not 5 billion to extend it to Jersey?" he asked. An interstate subway -- or at least one giant regional network, consisting of the MTA, the Port Authority and NJ Transit -- figures into others' plans. Richard Ravitch, former MTA chairman, said passengers could some day use the same fare media on Metro-North, the subway, or the PATH. MetroCards with specific dollar amounts already can be used on PATH trains. In Queens, the vast, subway-less neighborhoods near Nassau County could one day be crisscrossed by tracks -- a plan that has been alternately raised and abandoned since the 1920s. "I would hope there would be a political will," said Cudahy, calling the border at Nassau County "just an artificial boundary." Of course, all the gizmos and expansions cost money. With the MTA facing deficits that only grow, some say the agency will turn to more subsidies, as officials now say they must. "I see no evidence that there's a solution to the problem of underfinancing," said Hood, the author. Speaking of more money, what will the fares be like in 100 years? "As my grandmother would say, 'God only knows,' said Fischler. "Maybe it will be free! That'll be a nice target."